Such an easy task for me. With the sales going on at Macy’s (including a number of 80% off racks) and the coupons for 20% off your total purchase… this was gonna be a breeze. Since he didn’t give a budget amount I just bought the top 5 pair that I thought would fit best, and figured he could try them on at home and I’d return the ones that don’t fit. JACKPOT!!!! All five pair fit PERFECTLY! Admittedly, I cheated a little… his favorite pair of jeans are by Guess and 575 denim. Since Macy’s didn’t have 575 I focused on the Guess jeans. Because he wears a 34” inseam I tend to lean towards the basic cuts because of the longer option. 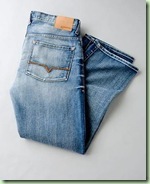 Many of the premium/special styles are 32” or 33” inseam. So here’s the final listing and amazing prices… now the hard part is narrowing it down to which ones will be returned! Guess Men’s Falcon Jean (slim fit, low rise, boot cut) in Midnight Gray (not same color at photo) Original Price: $98, Sale Price $28 **Found a pair on Ebay in a lighter shade of gray for $10! I was totally surprised that he liked the dark gray. I made him put them on with his white Nikes to show him the true effect. Seven for All Mankind Relaxed fit in Los Feliz Wash. Original Price $189, Sale Price $103 **These are so soft and broken in, they were definitely his favorites of the bunch before I even told him they were Seven. 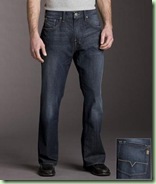 Guess Dean Relaxed Fit (easy fit, regular rise, straight leg) in Detroit Wash. Original Price $79, Sale Price $63 **Currently on sale at Macys for $58. A great basic jean that has a soft feel to it. 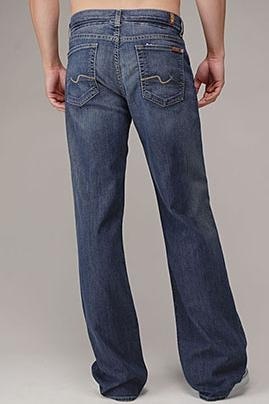 Guess Rebel fit (regular fit, low rise, straight leg) in World Wash Original Price $108, Sale Price $31 **I really like the pockets on these but the denim isn’t as naturally broken in as the others. 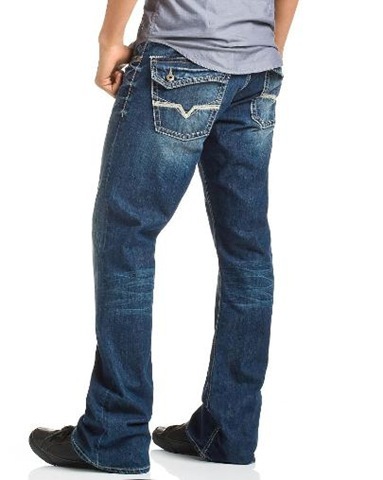 His favorite Guess jeans are Rebel fit and they wear-in very well with time. Guess Dean Zip Fly Relaxed fit (regular rise, straight leg) in Viper Wash, Original Price $79, Sale Price $63 **By default I think these earn my “return” vote… a lot more simpler than most of the others and the color is similar to some he already has.